a genus of flagellate protozoa parasitic in the intestines of humans and other animals, which may cause protracted, intermittent diarrhea with symptoms suggesting malabsorption. G. lamb´lia (called also G. intestina´lis) causes giardiasis. (jē-ar'dē-ă), Avoid the misspelling/mispronunciation Girardia. A genus of parasitic flagellates that parasitize the small intestine of many mammals, including most domestic animals and humans; for example, Giardia bovis in cattle, Giardia canis in dogs, and Giardia cati in cats. Many species have been described, but current research suggests that these should be reduced to only two or three. /Gi·ar·dia/ (je-ahr´de-ah) a genus of flagellate protozoa parasitic in the intestinal tract of humans and other animals, which may cause giardiasis; G. lam´blia (G. intestina´lis) is the species found in humans. Any of various flagellated, usually nonpathogenic protozoa of the genus Giardia that may be parasitic in the intestines of vertebrates including humans and most domestic animals. a common genus of flagellate protozoans and a major cause of nonbacterial diarrhea in North America and of intestinal disease globally. Many species of Giardia normally inhabit the digestive tract and cause inflammation in association with other factors that produce rapid proliferation of the organism. See also giardiasis. A genus of flagellates that parasitize the small intestine of human beings, domestic and wild mammals, and birds. A genus of flagellates that parasitizes the small intestine of human beings, domestic and wild mammals, and birds. a genus of flagellate protozoa parasitic in the intestines of most animals. They are capable of causing protracted, intermittent diarrhea suggestive of malabsorption, sometimes dysentery, but many infections may be non-symptomatic. Includes G. bovis (cattle), G. canis (dogs), G. caprae (goats), G. cati or G. felis (cats), G. caviae (guinea pigs), G. chinchillae (chinchillas), G. duodenalis (rabbits), G. equi (horses), G. felis (cats), G. intestinalis (G. lamblia; found in humans, pigs, budgerigars, monkeys), G. muris (mice, rats). The most common parasites in males were; Giardia lamblia (2. The presence of Giardia in the gut causes the intestinal epithelial barrier to lose proper function, although scientists are still trying to figure out the precise biochemical mechanisms responsible for this. Malatya'da yapilan calismalarda %5,2, %26,3 ve %6,2 oraninda Giardia intestinalis saptanmistir. El diagnostico de la presencia de Giardia spp se realiza por la observacion directa de trofozoitos y quistes en heces por el metodo del frotis directo [12, 39] y el metodo de flotacion con sulfato de zinc , en el cual se evidencia la presencia de quistes, la cuantificacion se realiza por conteo de formas quisticas y trofozoitos en una escala cualitativa dada en cruces [6, 12, 35]. Giardia is a one-celled parasite that's visible under a microscope as a flattish droplet shape with flagella, whip-like structures that help it move. Giardia is a one-celled parasite that's visible under a microscope as a flat droplet shape with flagella, whip-like structures that help it move. The O&P test came back positive for Giardia lamblia, which was addressed by the therapy that was administered. Gordts et al (22) ensayaron con 25 aislamientos de Giardia y declararon que mas de la mitad de los aislamientos de Giardia fueron muy susceptibles a la Cq in-vitro. The authors attributed these mucosal changes to the direct in jury by grasping action of the adhesive discs of Giardia trophozoites, toxic byproducts elaborated by the parasites . 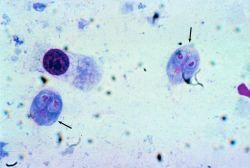 Protozoan parasites "as: cysts": 1 Giardia lamblia 04. Caccio, "Zoonotic potential of Giardia," International Journal for Parasitology, vol. Dogs that contract giardia often exhibit excessive diarrhea and, after prolonged exposure, weakness, even despite a healthy appetite and ample fluids.